It takes a lot of products to look this ok.
No one has been asking about my skincare routine but I feel like I finally have a solid one although I’m sure it will change in a few months when I become obsessed with some new product. 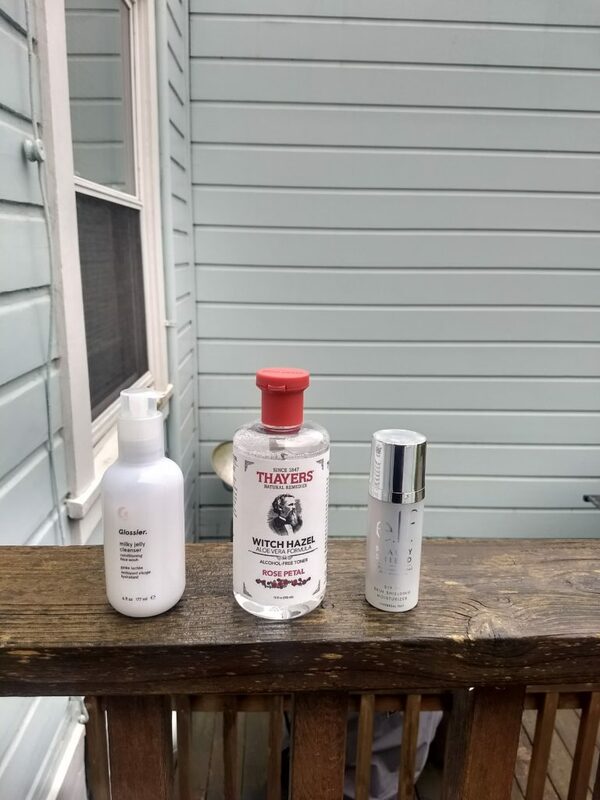 But as of right now in 2o18 I found the products that work for me. Also as you’ll see there is only one sort of exfoliator in the set. I’ve stopped exfoliating so often and my skin looks better for it. And I’ve invested in better sunscreen. So here we go! With the exception of the sleep mask, I use all these products every night. 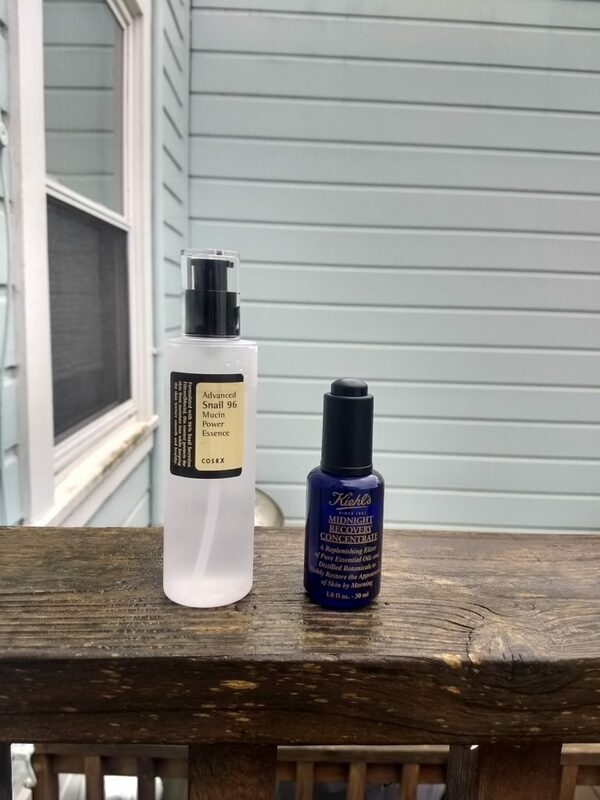 I also alternate my serum with the Valjean Labs Facial Serum, Restore Niacinamide + Zinc. I double cleanse at night to make sure my skin is clean and makeup free. I use Banila Clean it Zero Classic as my oil cleanser. It starts out as a balm but as I massage it into my face it emulsifies into an oil. It’s gentle enough to use on my eyes and takes off my waterproof mascara and eyeliner. As a lifelong oily faced girl whose skin is starting to get drier, using an oil cleanser seemed daunting like it would clog my pores and break me out but it doesn’t. And just to be sure all the oil and makeup and grime is off my face I follow it up with a foam cleanser. 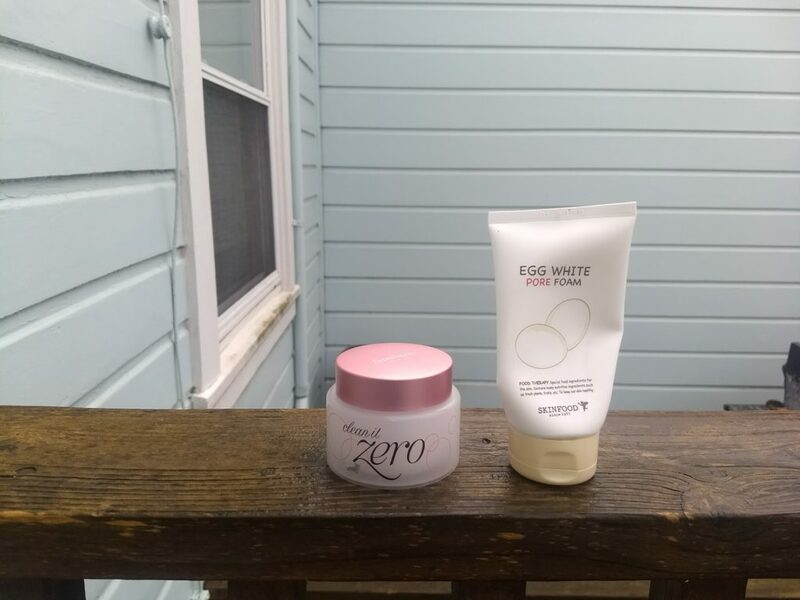 I use Skinfood Egg White Pore Foam to get off any remaining residue. The nice thing about Skinfoods cleanser is that while it is a foam it comes out much creamier and doesn’t have the stripping effect that lots of foam cleansers have. My skin feels clean but not tight or stripped after using these cleansers. After the face washing is done (and my bathroom counter is thoroughly soaked, oops) I move onto toner. 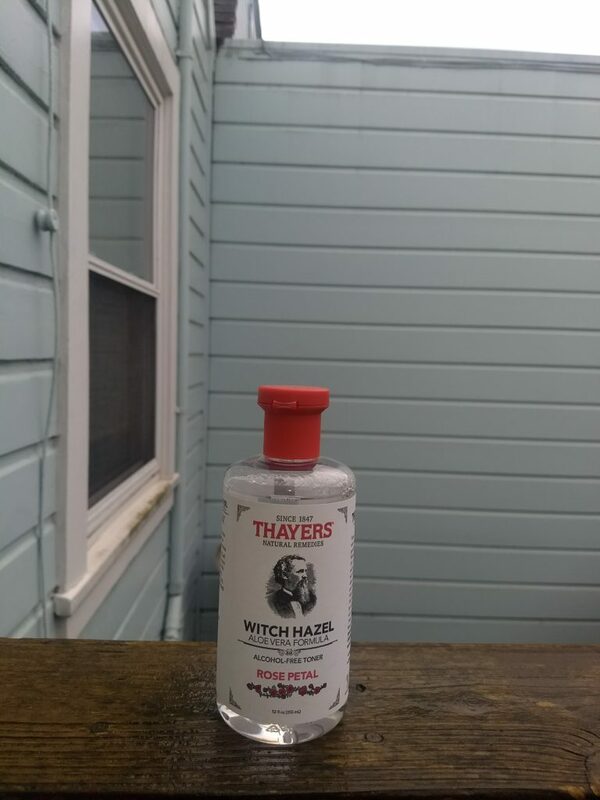 I use Thayers Witch Hazel Alcohol-Free Toner-Rose Petal. This preps my skin for the next few steps of my skincare regimen before I go to bed and it’s soothing and smells nice. It also gets off any soap I’ve accidentally left on my widow’s peak (I wear a headband while I wash my face which gives me a widow’s peak). It’s become such a part of my routine that I can’t not do it even though I’m not super sure what this does, skin wise. But on to the next step! After I use toner I move onto essence. I use Cosrx Advanced Snail 96 Mucin Power Essence. An essence is basically a pre-serum treatment and gives skin a little extra hydration. Snail is especially good for hydration and cell turnover and helps with a lot of different skin concerns. My main skin concerns are acne (and acne scarring) and redness. This essence is scent free and has a jell0-like texture. The best way to apply essences is to pat into skin and let dry so I usually brush my teeth and take any nightly medication I have so that this absorbs fully. One the essence is absorbed I move onto my serum. I use Kiehl’s Midnight Recovery Concentrate. I call this a serum but its more of an oil. However, although oils are usually used at the end of the skincare regimen, I use this one before putting moisturizer because of the serum-like ingredients (like primrose and squalene) and because it says I can. As I’ve said in other posts I don’t mind if my products have scents in them and this serum smells nice like lavender (which is one of the ingredients). I wake up with brighter skin after using this serum and that’s really all a girl can ask for, right? I try to give some time for this serum to absorb before moving onto moisturizer. I don’t use these at the same time but I alternate between using a normal moisturizer and a sleeping pack or mask. 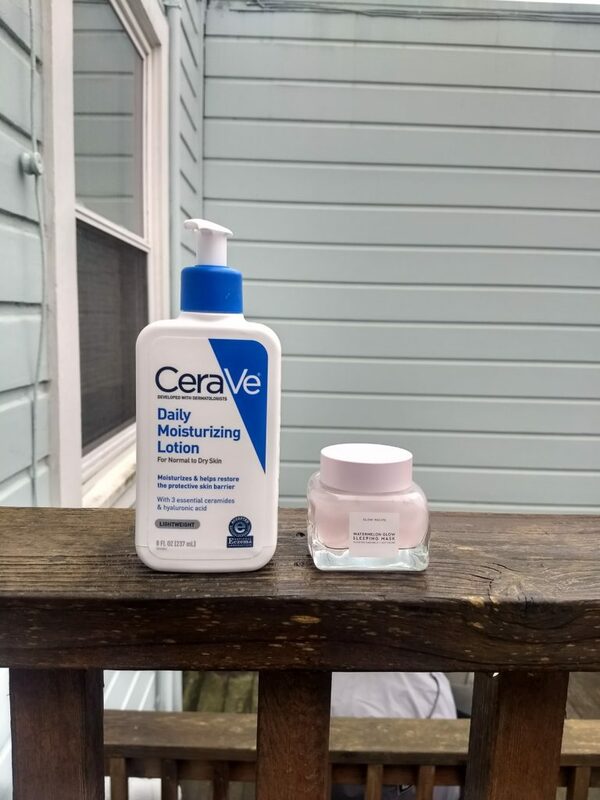 For a moisturizer, I use CeraVe Daily Moisturizing Lotion. I was initially hesitant about this moisturizer because I have combination skin and thick moisturizers clog my pores. 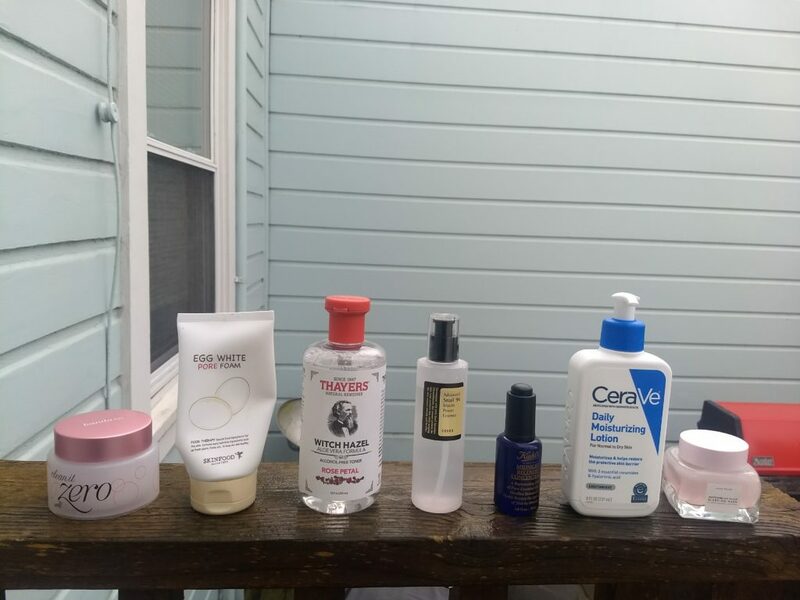 I’ve spent most of my skincare journey looking for products that target oily skin but as I’ve gotten older my skin has gotten drier and I need something with a little more moisture. The CeraVe moisturizer is thick but it absorbs so quickly I can barely feel it. It’s formulated by dermatologists that really know what the skin needs and gentle enough I’ve started wearing it in the morning as well. The best part is this bottle is huge and it’s going to last me a while. On days I need a little more glow I use Glow Recipe Watermelon Glow Sleeping Mask. The mask has hyaluronic acid and AHA’s so it moisturizes and gently exfoliates while I sleep. And this stuff seriously works. I wake up with smaller pores and soft skin. I tried a free sample of this before I spent the $45 and even just a few days of using the sample I could see a difference. The mask comes with a spoon to scoop out the jelly-like mask and all I need is a little spoonful of since it spreads out. The mask does have a scent, it smells like watermelon but once the mask dries I can barely smell it. Honestly, I’d use this every day if I wasn’t worried about using it all up too soon. While my night routine has a lot of steps my morning routine is simpler. Yes, my morning routine is only 3(ish) steps but that’s just skincare. My makeup routine products number in the double digits but that’s for another post. I start my routine with Glossier Milky Jelly Cleanser. The cleanser is pH balanced and incredibly gentle. It’s also safe to use around eyes which is nice for me because I occasionally I wake up with some eyeliner residue in the corners of my eyes. As an added bonus it also smells like rose and I’m into rose scented beauty right now. I like using a gentle formula in the morning to give my skin a break from how many products I use at night. It also takes off makeup and I use it when I’m too tired for my double cleanser (so Saturday nights usually). The cleanser does not lather nor does it leave a tight feeling but my face does feel clean after. My second step is toner (the same one I use in my nightly routine) and I use it for the same reasons. I’ve also started using my CeraVe moisturizer because the foundation I use (Fenty Beauty btw) is so matte. My last step is sunscreen. I use e.l.f. Beauty Shield SFP 50 Skin Shielding Moisturizer. It has vitamin C and it supposedly protects my skin from pollution. The sunscreen/moisturizer is tinted which I’m not sure I love. If it’s tinted is it makeup? If it’s makeup am I supposed to put my primer on before or after (I’ve been doing after) but it does the job of protecting my skin and I like that it’s SPF 50. So this is my daily routine. I just want to know if anyone uses more products than me and if so where do they fit them in.